On the anniversary of becoming baseball commissioner, Rob Manfred speaks with the AP and says it is possible the strike zone might be raised to the top of the knees. 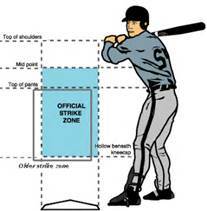 Baseball's strike zone could be getting a slight lift. Strike zone data was included in a presentation given to owners last week at their meeting in Coral Gables, Florida. An agreement with the players' association would be necessary to make a change for this year, and baseball officials said the matter is likely to be discussed during collective bargaining, which would delay any change until 2017. Without bottom-of-the-zone strikes, pitchers would have to adjust. Baseball has been looking at the new Olympic Stadium as a possible venue. He wouldn't discuss the possibility of shifting a high-profile matchup to England, such as Yankees-Red Sox. Manfred said that when he spoke last week of a possible expansion of the designated hitter to the National League, he should have included an emphasis that change is not likely. "I have been of the view for a number of years that a single mode of entry into the bargaining unit is probably the most sustainable and effective for the industry over time," Manfred said. "I think we were closer to getting there in certain rounds of bargaining than people may have understood, and probably it was a mistake not to push it across the finish line." Whether to shorten the season from 162 games, its length since the early 1960s, is a topic for collective bargaining. While he is concerned about the demands on players, "by the same token, there are certain economics built on a 162-game season. Something less than that has massive economic ramifications, not to even mention statistics and undermining the comparability of performances of players over time. It's not something you can undertake lightly." MLB recommended last month that teams have protective netting in front of seats between the dugouts and within 70 feet of home plate. Initiatives for youth baseball, such as Play Ball with the U.S. Conference of Mayors; integration of baseball's divisions into a unified structure; international developments, such as an agreement to stream games in China. "The most fun absolutely has to be when you're out there interacting with fans, particularly young fans," Manfred said. "I love going to the ballpark. I didn't think this was going to be the case: I miss the play of the game on the field now more than I did in my old job."